Gameweek One was fun, right? Quite a drawn out affair for my own team, hanging on to hopes that Luakau would do something. Quickly moving on then. The captain pick this week is not straightforward with no "gimme" games. I expect Everton to score the most goals this weekend of any team and Jelavic looks sharp and central to the attacking setup at Goodison. Van Persie's place at the top of the rankings this week is a reflection of his and Manchester United's indomitable record at Old Trafford. Chelsea look a little vulnerable and not yet the defensive monsters they were under Mourinho last decade. Arsenal are an enigma. They were unlucky not to score more against Villa last week but still looked way off the pace, but then go and put Fenerbace to the sword. A lot depends on Fulham and how they approach this game. 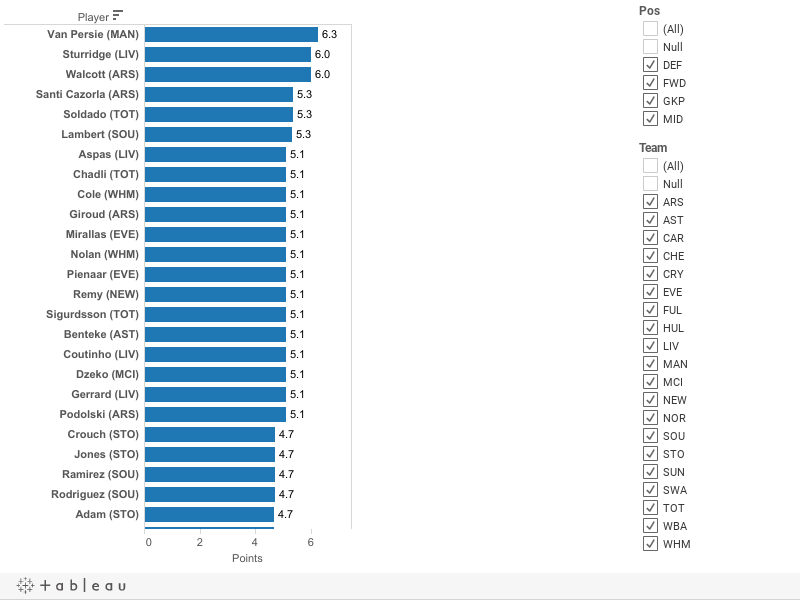 Spurs are heavily fancied and Soldado leads captain polls on various sites. On what evidence I ask?! I'm not personally into the new look Spurs yet. They'll have to do a lot more than they did against Palace. I am probably going to captain Van Persie. If I have a moment of madness I'll pick Sturridge instead. If I could take a free punt it would be on Jelavic.